(Inside Science) -- The Nobel Prizes in physics for the last two years honored advances and innovations in lasers. While lasers are plentiful today in laboratories, commercial production facilities and many homes around the world, they aren’t to be taken for granted. Lasers are used to cut diamonds or slice thick metal. They’re also used in electronics and surgeries where a much more delicate touch is required. This year's physics Nobel honored two advances in laser research -- the development of optical tweezers, and an innovative method to generate high-intensity, ultra-short laser pulses. Last year's prize was for the detection of gravitational waves -- using an instrument called a laser interferometer. What differentiates these three lasers from one another, and what makes them different from the laser pointer you use to play with your cat, has to do with the laser’s frequency, continuity and coherence. In 2016, a team of more than 1,000 scientists from more than 100 institutions and 18 countries did just that. In 2017, Rainer Weiss, Barry C. Barish and Kip S. Thorne won the physics Nobel for their work on the LIGO project. 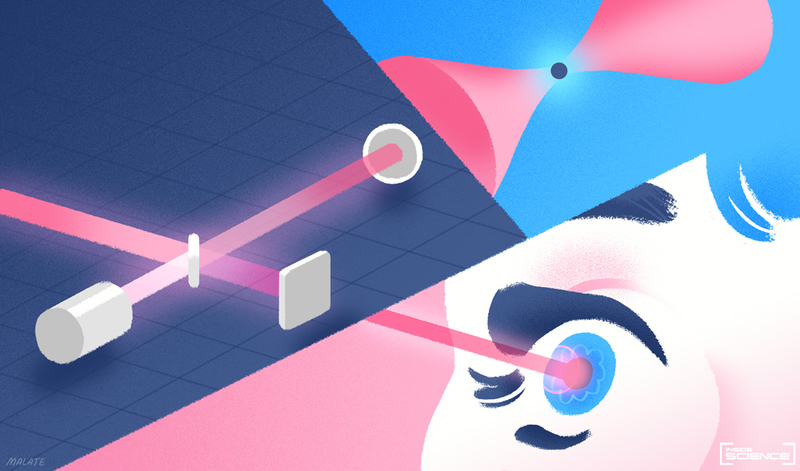 The interferometer works by sending one laser beam through a beam splitter and then merging those two beams to create an interference pattern that can be measured and analyzed. The laser used in LIGO is a continuous laser operating on one well-defined frequency that has high temporal coherence (what makes the laser focus on a tight spot, and keeps the beam narrow over great distances). LIGO at its most sensitive state can detect a change of 1/10,000th the width of a proton, which is the equivalent of measuring the distance to the nearest star, about 4.2 light years away, to an accuracy smaller than the width of a human hair, according to California Institute of Technology facts on LIGO. Optical tweezers, the technology that led to Arthur Ashkin's share in this year’s Nobel Prize, uses a similar, but much less powerful laser than LIGO. The invention uses the pressure from laser light to move and hold tiny objects, such as molecules or bacteria, without harming them. In the press conference announcing the physics prize, Nobel committee member Anders Irbäck demonstrated the principle on video by using a hair dryer to elevate and move a ping pong ball around. Today, scientists such as Steven Adie, a biomedical engineer at Cornell University in Ithaca, New York, use Ashkin's work to study the mechanics of cell movement. Adie and his team were inspired by Ashkin’s 1970 paper that demonstrated how optical radiation pressure can move microscopic particles. In the body, this kind of optical pressure could one day be used to understand how cancer cells migrate and metastasize, or how stem cells are able to develop into different cell types depending on the environment they find themselves in. While the LIGO and optical tweezers lasers have a few characteristics in common, the laser method developed by the other 2018 Nobel physics laureates, Gérard Mourou of the École Polytechnique, Palaiseau, in France and Donna Strickland of the University of Waterloo in Canada, is very different. Their technique of chirped pulse amplification stretches the laser in time to reduce its power, then amplifies and compresses it to create short and powerful laser pulses. It has also paved the way for the incredibly sharp lasers that are used in eye surgery to carefully sculpt the cornea without damaging the eye. The ultrapowerful laser pulses have applications in both basic science and in applications such as homeland security. “Everyone is really excited that Gérard won the Nobel Prize. We are very happy for him and think it is well deserved,” said Karl Krushelnick, a professor and director of the Center for Ultrafast Optical Science at the University of Michigan in Ann Arbor, which was formerly headed by Mourou. Claire Cleveland is a science writing intern for Inside Science News Service with degrees in journalism and biology & society from Arizona State University.